Transportation difficulties prompted North Toronto to reluctantly seek annexation by the City of Toronto in 1912. 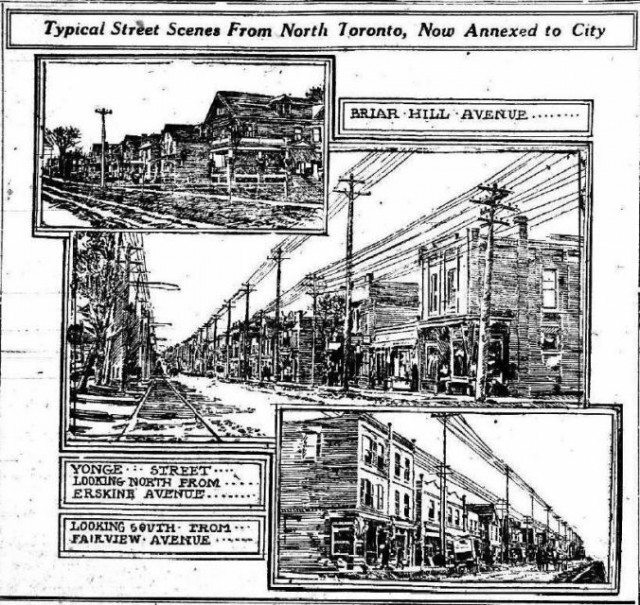 Renderings of North Toronto from the Evening Telegram, December 16, 1912. In December 1912, North Toronto was very much a community in transition. The most recent census listed the town’s population at 6,655—up from 5,217 the year before. That November had been a record month for new buildings, and many more permits were on the way as the area’s farmland gradually gave way to new subdivisions. And at the stroke of midnight on December 15, all 2,610 acres of North Toronto became part of the City of Toronto. In 1889, the previously unincorporated villages of Davisville and Eglinton formally merged to become the Village of North Toronto. In early 1890, the boundaries were extended, and North Toronto was upgraded to town status. The town grew in spurts over the next 20 years, evolving into a bedroom suburb of Toronto where commuters and their families enjoyed affordable and relatively quiet property within close proximity to the amenities of the growing City of Toronto. 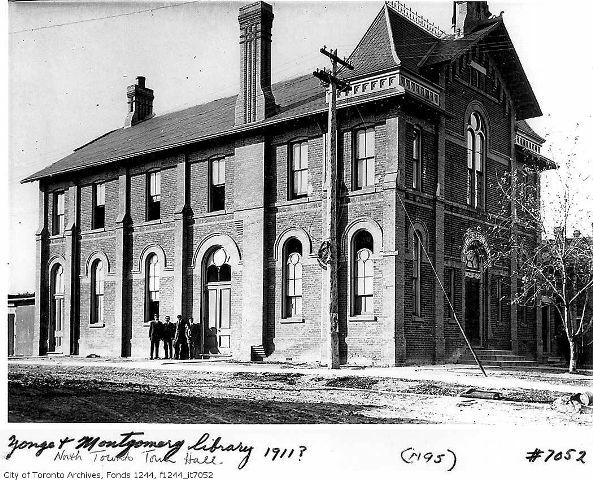 Like many of Toronto’s surrounding municipalities at this time, North Toronto struggled to find the capital necessary for the urban projects which the growing residential population increasingly demanded: street paving, electricity, plumbing, sewage, public schools, and libraries. 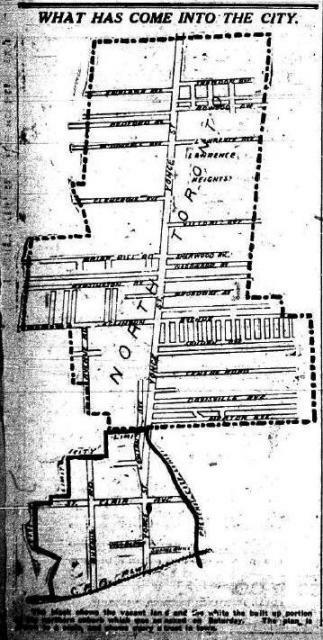 Accounts of North Toronto’s history often reference the tax laws of the time, under which York County properties classified as farmland were taxed at a lower rate than properties which had been subdivided into lots. Speculation in North Toronto boomed, as investors bought North Toronto land, hoping to cash in once the big wave of development finally came. Prior to annexation, however, many were taking advantage of the favourable farmland tax rate and refrained from actually building on their North Toronto assets, leaving the town with limited funds to spend on amenities. In his book North Toronto, historian Don Ritchie notes that in 1912, North Toronto “was essentially Yonge Street,” so much was the area’s development localized along the one road, with the population primarily clustered around the cross-streets of Davisville, Montgomery, and Bedford Park. Besides local traffic, the street was increasingly clogged by those using it as a thoroughfare to connect to downtown Toronto from other communities to the north. Unpaved Yonge Street, near Eglinton, circa. 1911. City of Toronto Archives, Fonds 1244, Item 21. To help relieve some of the congestion, the North Toronto Town Council created a committee dedicated to parallel roads, with the goal of developing alternatives to Yonge. This meant connecting existing smaller streets and widening them, often at the expense of homes which were blocking the route. Debate over these North Toronto projects continued through 1911 and 1912, as residents and town councillors attempted to get Oriole Parkway and Duplex Avenue connected and serviceable. 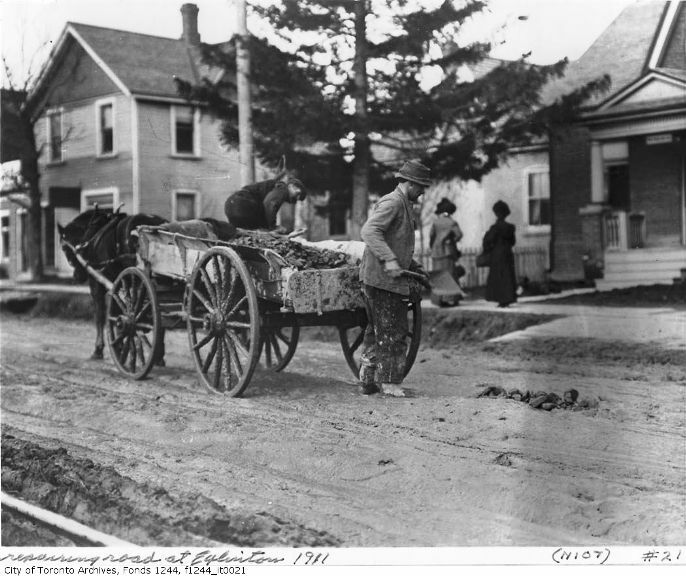 None of the streets in North Toronto were paved, although the Telegram reported that the town had embarked upon a massive cement sidewalk program in recent years, laying eight miles that summer alone. North Toronto citizens also had reason to complain about the quality of public transportation. The streetcar service along Yonge Street was broken up, as different franchises had contracts in the different municipalities, meaning that when passengers reached the end of one line, they were obliged to walk from one set of tracks to another and deposit a second fare to continue their journey, a situation deplored by much of the local population. Furthermore, the North Toronto section of Yonge had but a single line of track from the Toronto and York Radial Railway Company, known as the Metropolitan Division; this line had regularly spaced sidings along its route which allowed the streetcars heading in opposite directions to pass one another, but the single-track system still caused many delays. As a means of fighting congestion, the North Toronto Town Council proposed adding an additional track on Yonge Street. The issue of “double-tracking” Yonge raised considerable objections from the ratepayers in North Toronto; some were doubtful that the community could afford the project with its already growing debt, whereas others believed that a second line would take up too much room on Yonge to allow for anything else. A plebiscite to decide the matter was set for June. On May 10, the North Toronto Town Council met with Toronto’s Board of Control to discuss transportation options. When it became apparent that North Toronto was stuck for solutions, Toronto Mayor George Reginald Geary said: “Suppose that instead of submitting your proposed Metropolitan Railway agreement to your ratepayers on June 27, you submit an annexation by-law to your people, and see what we [the City of Toronto] will do for you.” From then on, the issue of North Toronto’s transportation future became linked with the push for annexation into Toronto. Over the next few months, the annexation question was debated in both municipalities. While Toronto was keen to acquire more land and increase its tax base, it was wary of taking on North Toronto’s debt and having to cover the cost of the town’s necessary infrastructure upgrades. In North Toronto, the concern was whether Toronto would actually invest in the area and solve their local transportation woes, or if they would be better off trying to address their problems themselves. The process of devising the terms of annexation continued over the next few months. A variety of economic factors appear to have slowed the process, not the least of which was whether Toronto would agree to take on the entirety of North Toronto’s debenture debt. Many in North Toronto continued to argue that the Town could find solutions to its problems without annexation, but their voices seemed to be becoming the minority. Nearly every Toronto newspaper began writing editorials praising North Toronto and supporting its annexation. Land speculation appears to have remained a booming business throughout the year, with many properties enthusiastically advertised in Toronto newspapers with the promise of imminent annexation. The issue was finally put before North Toronto town council in mid-September, where it was narrowly approved by a vote of four to three. "The best buying in North Toronto to-day." 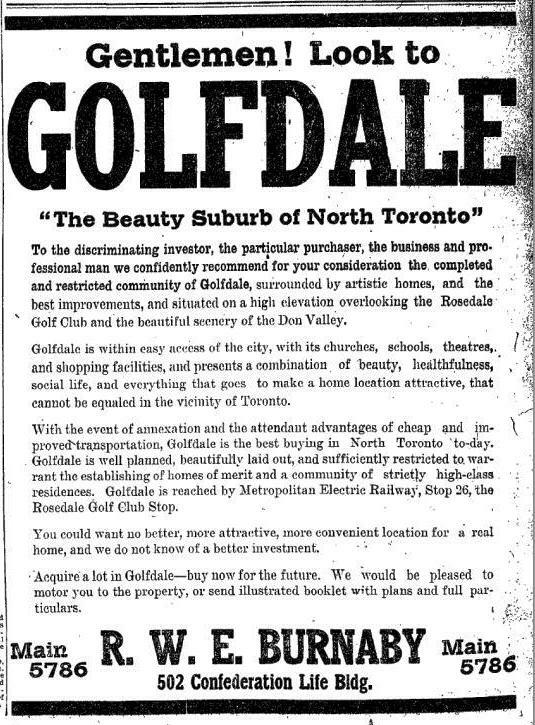 Advertisement confident that annexation is imminent, from the Globe, July 13, 1912. The final hurdle was overcome at the end of October, when the Ontario Railway Board (the forerunner of the Ontario Municipal Board), approved the application for annexation. Opponents had mounted a series of arguments against it, mostly hinging on procedural errors. Board chairman Leitch asked the lawyer representing the annexation opponents: “Outside these technical objections, have you any good and sufficient reason why the city and town should not be united?” When referred to North Toronto’s sewage system debentures, Leitch responded, “Why, the City assumed that debt, and your clients should not object to somebody else helping to pay their debts.” With that, the date of North Toronto’s annexation to the City of Toronto was set for December 15. Over the next few weeks, City officials worked out the details, planning new fire zones and polling subdivisions, and inspecting the latest addition for themselves. Although much was found to be satisfactory, some needed upgrades were immediately identified. North Toronto’s fire department consisted of five stations, with a force that was entirely volunteer. The North Toronto police and fire department had evidently been in the practice of sharing horses, and the new upgrades resulted in a temporary horse shortage. The Toronto contingent also took exception to the jail cells in the town hall which opened directly onto the street, and made plans to alter the structure of the building. Oulcott's Hotel at Yonge and Montgomery, which became Postal Station 'K' following annexation. City of Toronto Archives, Fonds 1244, Item 297. North Toronto still had some work of its own to do. On December 7, the cornerstone was laid for the new high school which would become North Toronto Collegiate. The extensions of Duplex Avenue and Oriole Road remained key projects, with Duplex Avenue emerging as the immediate priority for alleviating Yonge Street congestion. The town engineer, E.A. James, devised plans to extend Duplex north to Glenview—plans which called for the destruction of James’ own house. Toronto’s Board of Control asked North Toronto to hold off on this legislation, but the town opted to press on with it to guarantee its completion, prompting objections from some on the town council that this could alienate the community from the City once annexation took effect. On the afternoon of December 14, North Toronto held its final town council meeting. The Telegram noted that Wilfred Servington Dinnick of the Dovercourt Land, Building and Saving Company took the opportunity “to express his appreciation of the courteous manner in which both he and his company had always been received by the Council.” Dinnick had indeed done very well by North Toronto, having planned and instigated the prosperous new Lawrence Park development a few years earlier. 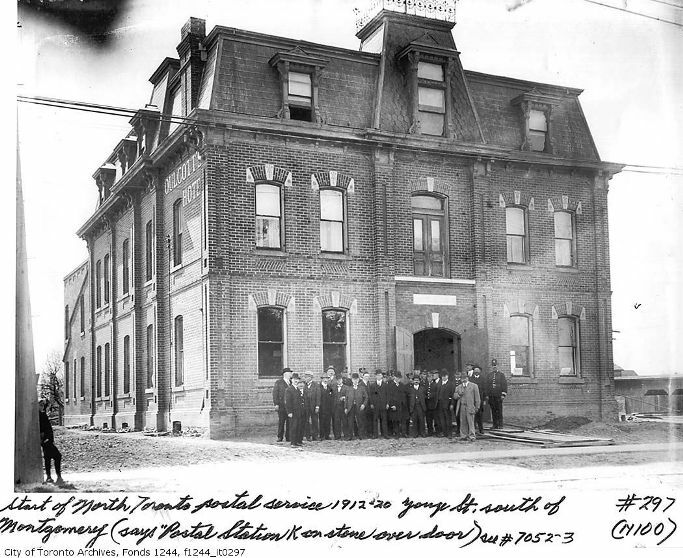 That evening, town representatives and officials gathered for a banquet at the town hall, to remember North Toronto and to celebrate its merger with the larger city. A band provided musical entertainment, and North Toronto handed the golden key to the town’s treasury to Mayor Horatio C. Hocken. North Toronto Town Hall, at the northwest corner of Yonge and Montgomery. City of Toronto Archives, Fonds 1244, Item 7052. He added: “I have always been an advocate of the tubes, and I am still of the opinion that an underground railway to St. Clair Avenue was one of the solutions to this problem. If I am mayor for any length of time I will give this question my earnest attention.” Despite Hocken’s pledge, progress was slow. Nevertheless, North Toronto eventually got its contiguous, one-fare streetcar connection to downtown when the line was taken over by the TTC in 1922, 10 years after joining Toronto. Additional material from: F.R. Berchem, Opportunity Road: Yonge Street 1860 to 1939 (Natural Heritage/Natural History Inc., 1996: Toronto); The Globe, June 6, June 7, June 14, July 6, July 8, July 9, July 13, September 16, November 4, December 3, December 6, December 16, 1912; Derek Hayes, Historical Atlas of Toronto (Douglas & McIntyre, 2008); J. William Hood, compiler, Street Railways – Toronto: 1861 to 1930, Maps Project: Handbook No. 7 (Co-published with the Eastern Canada Transit Club, 1999: Toronto); Don Ritchie, North Toronto (Boston Mills Press, 1992: Erin); The Toronto Daily Star, June 17, July 28, 1911; May 10, May 13, May 14, May 28, May 29, May 30, June 3, June 21, July 5, July 6, July 8, September 18, September 26, October 11, November 1, November 27, December 9, December 11, December 14, December 16, 1912; The Evening Telegram, November 22, December 4, December 9, December 11, December 12, December 14, December 16, December 17, December 18, 1912; Toronto Historical Association, A Glimpse of Toronto’s History: Opportunities For The Commemoration Of Lost Historic Sites (City Planning Division, Urban Development Services, City of Toronto, 2001); Toronto Public Library Board, North Toronto in Pictures 1889-1912 (Toronto Public Library Board, 1974); The Toronto World, July 4, July 6, November 25, December 16, 1912.